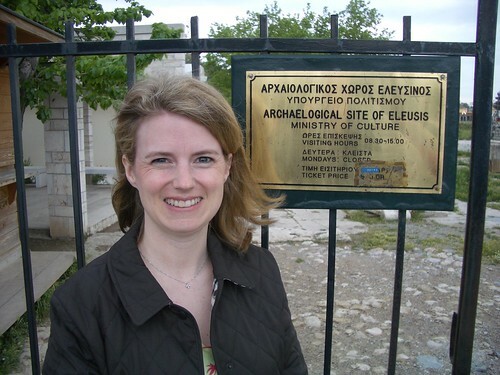 Weasel's Journey: Greece Trip Report, Part II. 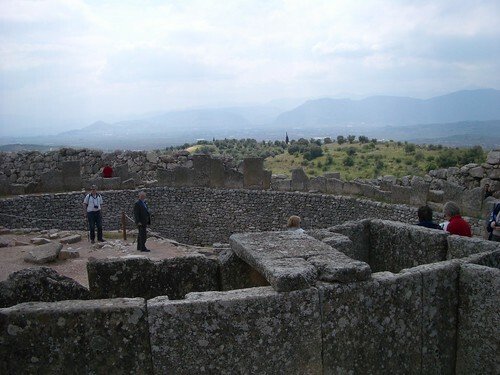 George picked us up at 8:00, and we set out for an abbreviated tour of the Peloponnese. 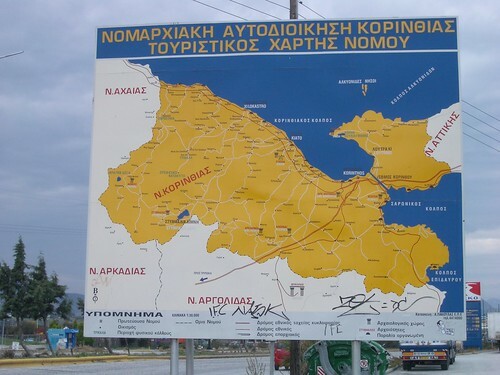 The Peloponnese is a very large peninsula near Athens that is home to the ancient cities of Corinth and Sparta among many others. We were able to hit only a few highlights and would love to return someday to see more. To set the tone for this adventure, let me say that George speaks very good English, having lived in NYC for 15 years, but he has a very heavy accent (Greek mixed with Yankee perhaps?). He could never get my name down right. He started off asking me about ten times to repeat it, and after several failed attempts at the pronunciation, he settled on calling me "Illinoise." I've answered to Weasel, Weasie and Weezer most of my life; now I also have a Greek nickname. Back to the Peloponnese... on the way there we passed a sign pointing to Ancient Eleusis. 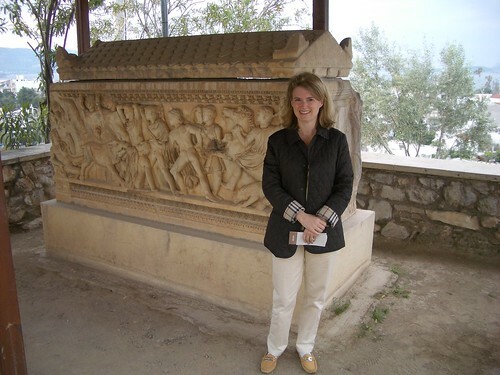 I insisted to George that we turn around and visit it, even though he assured me it was a very minor Greek site. I didn't even attempt to explain to George about American sororities, but suffice it to say that no good Chi Omega would pass up the chance to visit Eleusis. 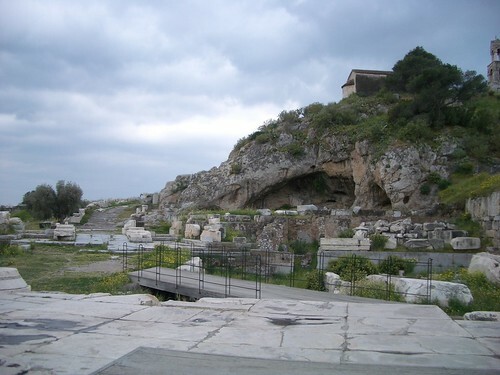 We actually found Eleusis an interesting place. 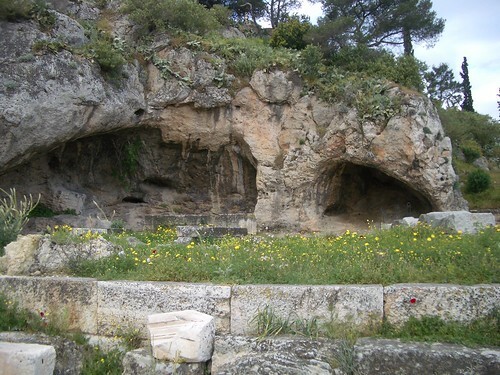 There are quite a few ruins of an ancient temple, and there is a large cave where Pluto was said to have carried Persephone off to the Underworld. 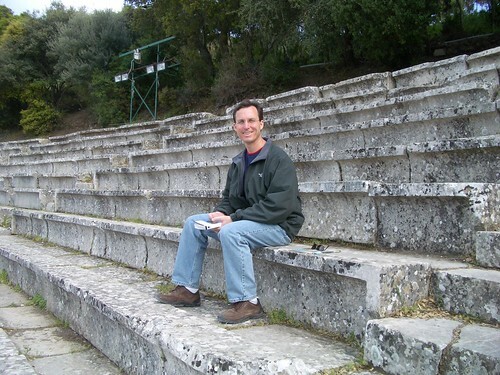 Robert was a quite a good sport to listen to what I remembered of the tale of Persephone and Demeter and to indulge me while I talked of the Eleusinian Mysteries (he was to get me back later by dragging me on a wild goose chase in search of the town of Marathon). 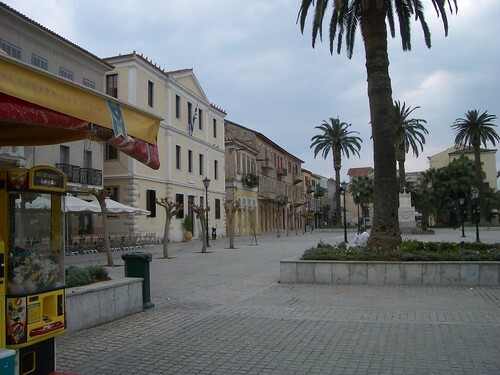 Having completed my pilgrimage, we continued on to the Peloponnese. The cape around the Peloponnese was treacherous for boats in ancient times, so they often dragged ships across the Corinthian isthmus to journey from the Aegean Sea to the Ionian. At some point a very deep (150 ft?) 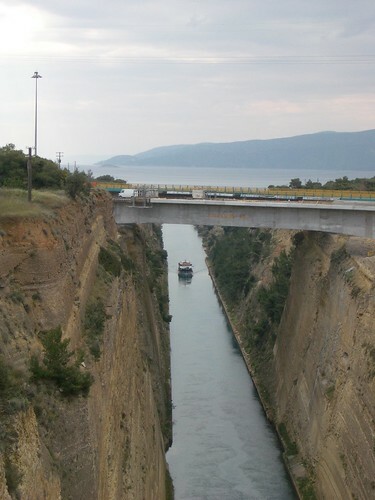 canal was dug, mostly by slaves, to connect the two seas and allow easier passage. We stopped there and watched a boat travel through - quite fascinating. Next we stopped at the Temple of Apollo gift shop where, in my heightened fraternal spirit, I bought several owl souvenirs in addition to a pretty vase that is a reproduction of some Greek relic in a museum somewhere. The girl who painted the vase is the third generation of her family to be in this business, and it was fascinating to watch her work. Robert is sure that George made a big commission off of my purchases, but none the less, I was pleased that we stopped there. 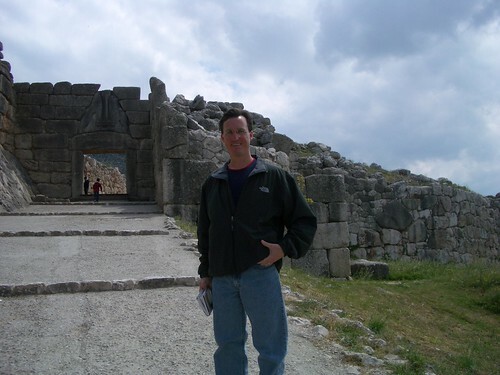 Leaving the shop, we went to Ancient Corinth. This was an impressive site. 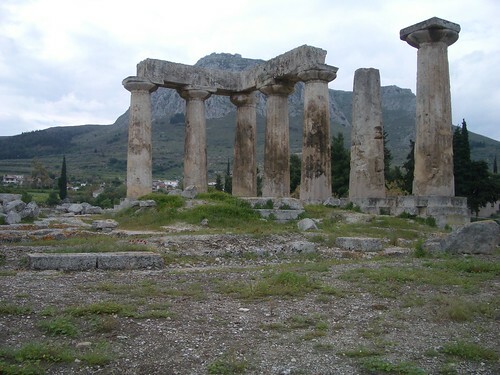 There are about seven Ionic columns remaining from a Temple of Apollo which stood there around 500 B.C., and the ruins of the ancient town are quite interesting. We even saw the rock where St. Paul preached to the Corinthians on his visit there. 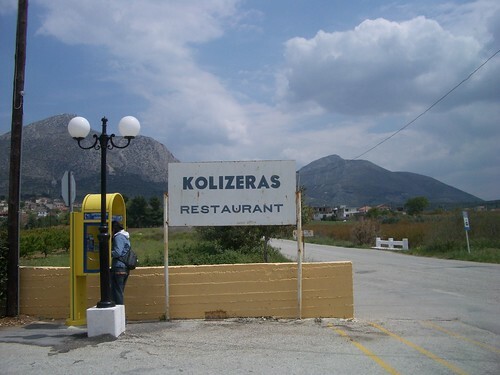 We traveled on to Mycenae, stopping for lunch at a pretty little Greek restaurant (where they proudly display a picture of Dan Quayle eating there - I bet that impresses a lot of tourists!). 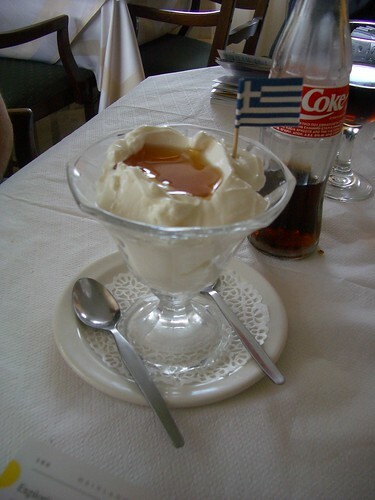 Yogurt and honey for dessert - yum! 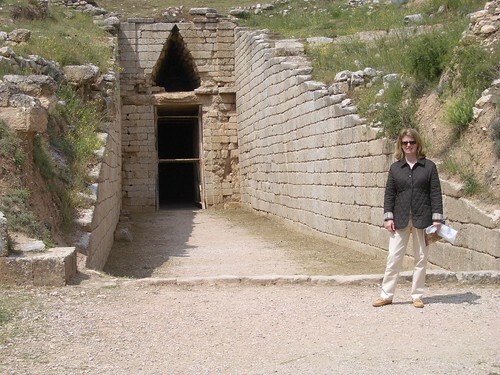 I loved Mycenae. 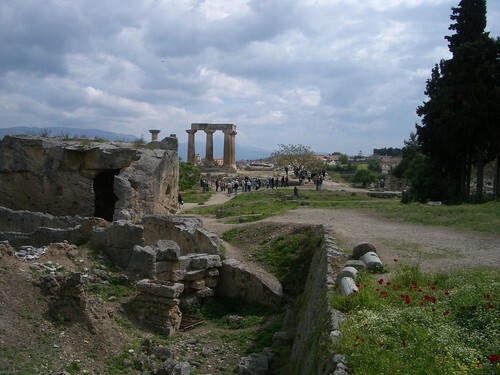 Its ruins were discovered by a German man who was intent on proving that Homer's tale of the Trojan War was grounded in fact. 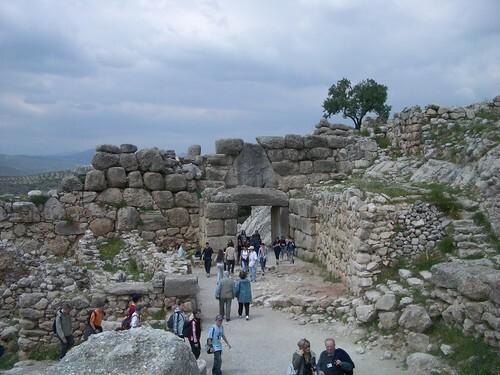 Mycenae was the home of King Agamemnon who led the Greek army when it set off to retrieve his brother's wife Helen from Troy. Leading into the town is a beautiful gateway with large lions above it. It was so neat to walk under it and think of Agamemmnon and his queen Clytemnestra passing the same way thousands of years before. The tombs of Agamemnon and Clytemnestra have also been discovered there, and they are these very cool, very large underground "beehives." 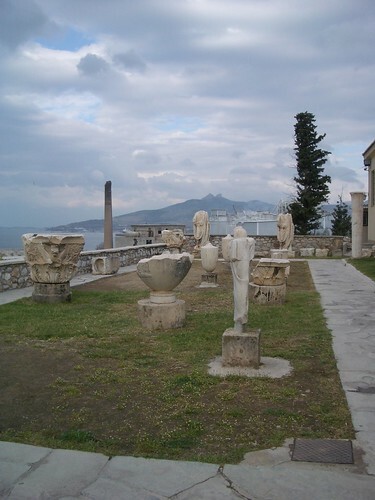 There were a lot of treasures found there as well, but these now reside in a museum in Athens. 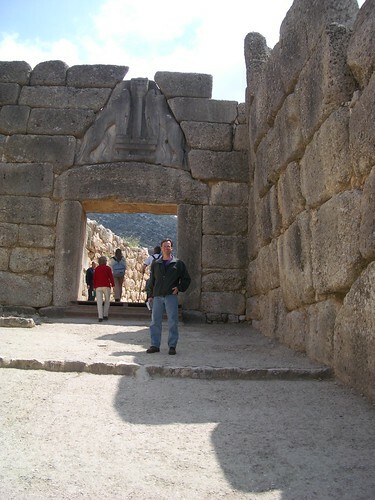 We spent quite a bit of time wandering around the ruins of Mycenae before departing for Epidaurus. 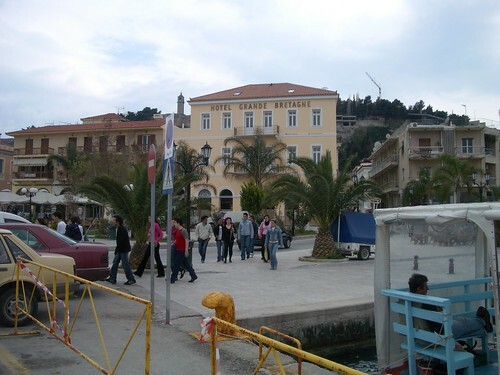 On the way to Epidaurus we passed through the seaside town of Nafplio, which was quite lovely. It would be a nice place to stay if we ever return to explore more of this area. 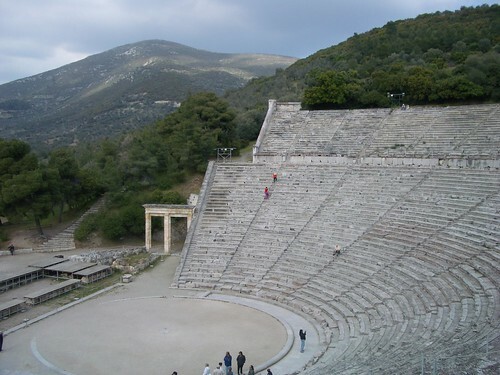 Epidaurus is a wonderfully intact amphitheater where the Greeks performed their drama. The acoustics are nearly perfect. 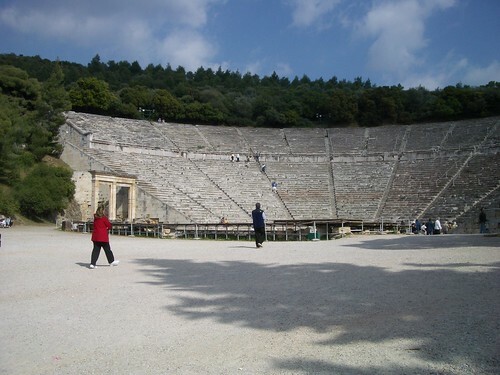 We climbed all the way to the top row and could easily understand other tourists standing in the center of the stage and speaking in quiet voices. 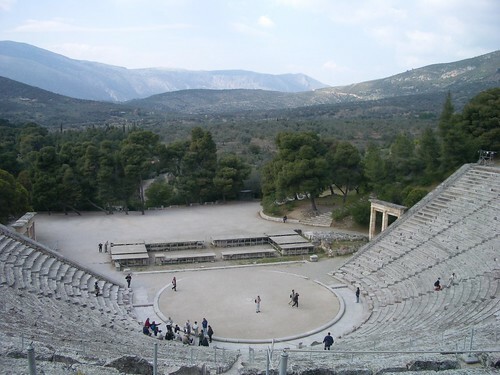 The countryside around Epidaurus is quite lovely, and the view from the amphitheater is a nice one. We returned, exhausted, to our hotel about 7:00. I tried to sleep in the car, but if George caught me, he'd scold, "Illinoise, you're not listening to what I'm telling you about my wonderful country!" We ate an unmemorable meal in a smoky Italian restaurant with decor reminiscent of The Olive Garden, but it was close to our hotel and I was too tired to venture out much further. Oh my goodness. I want to go! 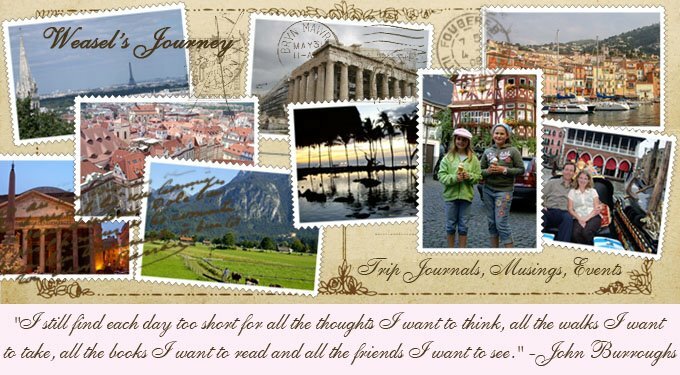 Fabulous pictures, I love living vicariously through other people's travels. Found you from another blog and I started reading away...scrolled and stopped abruptly at the Demeter and Persephone part and thought of my Chi O days, hit page up and discovered you are a Chi O too--figured you had to be one of us because no one else would have done a U turn to visit when they saw a sign for Ancient Eleusis. We will be married 21 years this year too. I am off to enjoy your wonderful trip. One day we will go to Greece. This month's cover on Conde Nast's Traveler is so breathtaking.